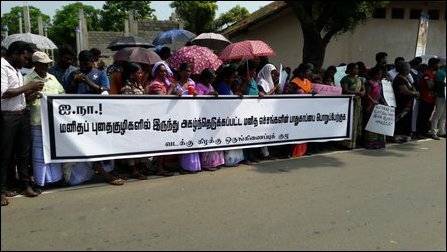 There must be a credible independent international mechanism to oversee and ensure that the human skeletal remains exhumed from the Mannaar killing fields get transported without the risk of tampering with the evidence by the SL State, the team of lawyers representing the families of enforced disappeared in Mannaar have cautioned. The lawyers, who didn't wish to be named, said they have urged the Bishop of Mannaar and are preparing to take up the matter with international actors once the exhumation commences again on 02 January 2019. The lawyers also told TamilNet that they would stand firm in their demand to be allowed to monitor the entire transportation process. “It is not about individual trust on the personalities involved. However, the participation of those representing the victims must also be ensured if the process is to be called victim-centric,” they said. The matter would also be taken up with the Mannaar Magistrate, they said. There is no instruction from the court to allow any person involved in the exhumation to transport the skeletal remains as far as they were informed, the lawyer team said. Their comment follows some reports in the Tamil media that one of the personalities involved in the exhumation was about to transport the material to a foreign lab. 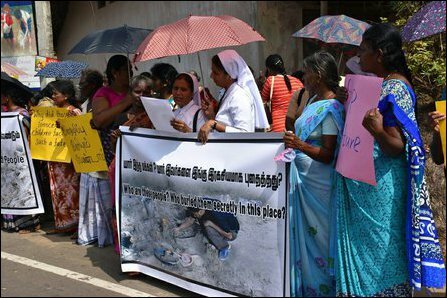 As the location of the mass graves near SL military hotspots and the nature of exhumed skeletal remains as well as other material indicating the period of the massacre, were pointing the victim population's collective identity, the SL State would do whatever it could do to hamper the forensic investigation process, they said. The exhumation process took a turn on 06 December when skeletal remains of two legs were found locked together into a single iron shackle at Mannaar mass grave. 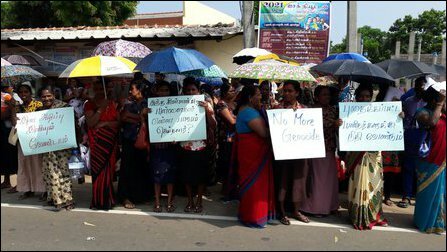 In one of the big rally be mobilised, more than one thousand people belonging to families of enforced disappeared and various grassroots groups across the five districts of North participated in a protest in Mannaar on 12 December. The participants carried banners that claimed the victims were subjected to a genocidal massacre. 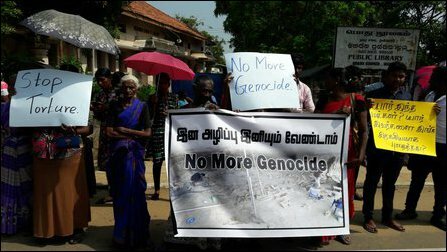 In the meantime, a section of Colombo-based think-tankers claiming to belong to ‘minority’ Tamil community, have started to divert the attention away from the genocidal narrative by attempting to twist the focus of the matter from comments serving the agenda of their funding sources, the lawyers further warned. 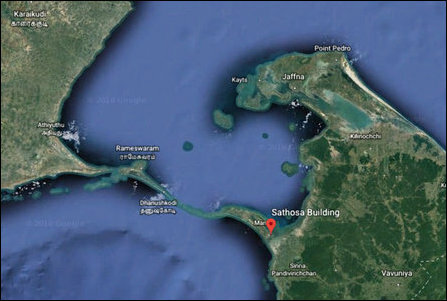 The Cooperative Wholesale Establishment (CWE/Sathosa) premises, where 266 skeletal remains of victims including women and children have been exhumed so far, is located just across the Cooperative Secretariat Building at the entrance to Mannaar island on A14 highway. The Co-op Secretariat is a two-storey building which was used by the occupying Sinhala military for 30 years. It was only handed over back to civil authorities on 05 November 2018 by the SL Army. The sub-posts of two SL Army brigades, the 212 Brigade, which has its headquarters in Tha'l'laadi and the 215 Brigade headquartered in Uyilang-ku'lam along with a special intelligence squad were located in the building. 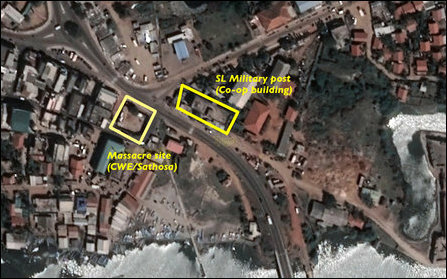 Any civilian observed near the vicinity in the early 1990s were gunned down by the Sinhala soldiers, and the area remained as a high-security military zone for several years. Tha'l'laadi and Uyilang-ku'lam are situated in the mainland.